Update: In EA's quarterly earnings call, CEO Andrew Wilson confirmed that a "premium" - that is, not free-to-play - Titanfall something is coming this year. It could be a game, it could be a Titanfall-brand toaster. Whatever it is, it's scheduled for 2019. On the heels of the surprise launch of Apex Legends, a new free-to-play battle royale game set in the Titanfall universe, developer Respawn Entertainment says there's more Titanfall in the pipes. CEO Vince Zampella tweeted that "we are also working on more Titanfall for later in the year," though he didn't specify what this mystery content is or when it will arrive. 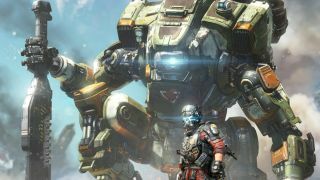 EA's latest financial report mentions plans "to grow Apex Legends and related Titanfall experiences," so Zampella's teaser may be connected to new content for the fledgling battle royale. In any case, whatever it is he's hinting at, it's almost certainly not Titanfall 3. As our sister site PC Gamer reported, Apex Legends project lead Drew McCoy recently confirmed that Titanfall 3 is not in development. Kotaku previously reported that Titanfall 3 is indeed real and was originally scheduled to release in late 2018 - so one popular theory is that Titanfall 3 was scrapped and reworked into Apex Legends - but it's definitely not an immediate possibility. As recently as last December, Respawn posted multiple job listings for its Titanfall development team. However, most of these listings have since been updated and are now tied to Apex Legends. There is one listing for a developer support specialist for an unannounced project, but seeing as how it specifies VR setup and maintenance, this listing is probably related to Respawn's unnamed VR war game. Speaking of which: Zampella confirmed that this mysterious Titanfall project is separate from the studio's VR game in a follow-up tweet. Whatever it is, it's supposedly coming this year, so we shouldn't have to wait on it for very long. Given the difficult journey that led to Apex Legends, we can safely assume the studio won't pump out another battle royale game anytime soon. However, from its newly published content roadmap, we do know that Respawn plans to support Apex Legends for months and years to come.